The new Volkswagen Passat Saloon is suave, spacious and boasts an upmarket interior. It’s the kind of swanky large car that’s ideal for families who want to feel good out on the road. Now into its eighth generation, it offers a relaxing rather than entertaining driving style, and feels better built than most of its peers. This is the Saloon variant, but if it’s not big enough or practical enough for you, there is also the option of an Estate body style. OSV takes a closer look at what it’s all about with our 2017 Volkswagen Passat Saloon review. 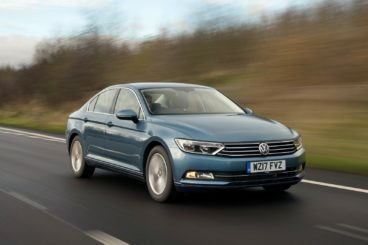 The Passat has never been the most fun car to drive in its sector, but its drivability has been improved this time around. Its new underpinnings give it a bit of an edge, while the fact that the car has lost weight but gotten stronger has also helped to boost its dynamics. There isn’t too much body lean in bends, there’s lots of grip available and the steering is precise. We wouldn’t say the Passat is what you could call involving, but comfort levels are especially good. All models come with a standard 6-speed manual gearbox with the option of a DSG twin-clutch automatic transmission. If you can afford it, we recommend specifying it. In terms of the engines, a 2.0-litre diesel that produces 148bhp is our top pick. It’s smooth, refined engine, covers the 0-62 sprint in 8.7 seconds, and should have all the power most buyers need. A 178bhp costs a bit more but doesn’t really add anything of note. There’s also the option of a 1.6–litre diesel engine, but it’s less refined and requires more gear changes to get the desired power. A BlueMotion version of this unit is available, but it’s slower and has longer gearing. It also gets stiffer suspension which results in a firmer ride. A 4MOTION twin-turbo diesel engine tops the range. It develops 237bhp, comes paired with the fantastic DSG automatic as standard, and it also gets grippy four-wheel-drive as standard. 0-62 is dispensed in just 6.1 seconds. Petrol engines are a welcome addition to the Passat range for 2017. Our favourite is a 1.4-litre 148bhp engine that blends economy with performance to good effect. There is lots of pulling power available immediately, and it drives pretty much like a diesel. It saves on fuel by shutting down two of its cylinders when they’re not needed. For more power, try a 2.0-litre petrol that can be paired up with either a 6-speed manual ‘box or a 7-speed dual-clutch auto. It develops 217bhp and can get you from rest to 62mph in 6.7 seconds. Rounding off the range is a hybrid model that we first saw in 2015. It combines a 114bhp electric motor with a 154bhp 1.4-litre TSI petrol engine and can go for 31 miles on pure battery power. 0-62 is covered in 7.4 seconds, but it’s not one for the enthusiasts as the extra weight blunts performance in bends. Volkswagen pride themselves on the build quality of their cabins and the Passat is yet another case in point. The upmarket interior is distinguished by top-notch materials and excellent fit and finish, and once more the Passat looks like a car that will cope well with family life. It’s a quiet and comfortable cabin too, although opting for bigger alloys will have a negative impact on ride quality. All models come with the brands Dynamic Chassis Control as standard, though, so things never get too bumpy in the conventional models. The hybrid model, on the other hand, bumps and jolts now and then, thanks to its extra weight. The plastics used on the dashboard are the best we’ve seen in this class, while the design of the dash is tasteful and elegant. Flashes of chrome lift the ambience and quality even further, while brushed chrome inserts are standard on even the entry-level model. In terms of how practical it is, its extended wheelbase means that it’s got more interior space than last time, while its 586-litres of boot space has also been extended. That’s a sizeable boot, and you can easily fold the rear seats for more space. SE models get the benefit of a ski hatch which helps with longer items, while the hybrid’s batteries don’t eat into the boot space. There is lots of head and legroom for all, with only the middle seated passenger feel a bit cramped thanks to the transmission tunnel. Upfront, space is excellent, and the car comes with plenty of storage spaces, such as a reasonable glovebox and large door pockets. Standard kit is excellent across the range, with entry-level models getting a brand new 8” central touchscreen and chrome inserts. They also get Bluetooth, air conditioning and a digital radio. The SE Business trim doesn’t cost a lot more, but adds a 12.3” Active Info Display that some buyers will find useful. Optional extras, meanwhile, include a £250 electric boot lid, a £150 heated windscreen and a Kenwood sat-nav system for £600. Is the Volkswagen Passat Saloon safe? It landed all five stars when crash-tested by Euro NCAP and gets anti-lock brakes, electronic stability control and lots of airbags as part of its standard safety kit. A Driver Assistance Pack Plus is well worth adding if you can spare an extra £1,200. It comes with lane-keeping assistance, autonomous emergency braking, pedestrian detection and traffic jam assist. Prices for the new car start out from £21,610 and rise to £36,785. If you prefer to lease, you can pick up a deal from £282 + VAT per month. For more information on our leasing deals, check out our page here. In terms of its running costs, the hybrid model is the cheapest to run on paper. According to Volkswagen, it will return 156.9mpg at best, but it’s highly unlikely that you’ll achieve such headline figures. Instead, it’s better to expect average returns of 53mpg. The 1.6-litre BlueMotion diesel engine, meanwhile, returns 76mpg economy, but adding the BlueMotion technology bumps up the initial cost of the engine. A 2.0-litre 148bhp diesel returns a very respectable 67.3mpg, while the bigger 187bhp variant returns the same. The most frugal petrol engine is the 1.4-litre 148bhp unit which returns 57.6mpg when paired with the manual ‘box, while the 2.0-litre 217bhp petrol engine manages 44.1mpg. The Passat is now almost as executive as the likes of BMW. The introduction of petrol’s has really livened up the selection of engines. All passengers will feel comfortable with the space that’s on offer. It’s a major shame to report that the Passat just isn’t as fun as some rivals. It’s expensive to buy and won’t return economy anywhere near the official figures. Let’s see how the car fares against its rivals in the comparison section of our 2017 Volkswagen Passat Saloon review. The new Volvo V60 Sportswagon looks better than all those old, boxy Volvo Estates from the nineties, and it also boasts high comfort and safety levels. Its design is old and this has an effect on the way it drives. There is lots of grip available and the handling is nice and predictable, but the steering is heavy and the suspension is overly firm. That said, there are few cars better at tackling long motorway journeys than the Volvo V60. It barely makes a peep and the seats offer plenty of support. In terms of its engines, the D4 diesel is the class-leader when it comes to performance. It gallops from rest to 62mph in 7.7 seconds, produces 187bhp, feels smooth and delivers its power effortlessly. We recommend adding the 8-speed automatic transmission as it will make a big difference to your enjoyment, but it does cost an extra £1,500. There are two petrol engines available, a T4 model that develops 187bhp and a Polestar model that develops a titanic 362bhp. This latter model is rapid, and can haul you from a standstill to 62mph in a matter of 4.8 seconds. It gets four-wheel-drive as standard as well as a responsive 8-speed auto transmission. A D6 hybrid engine rounds the range off, but thanks to its high listing price it’s difficult to recommend. Moreover, it’s not the cheapest to run. That award goes to the D2 model that can return 72.4mpg. Meanwhile, our top pick, the D4, returns a very impressive 70.6mpg. 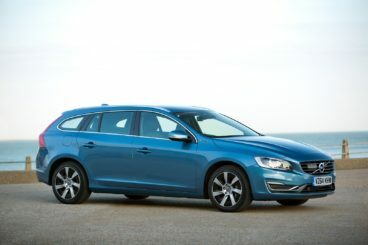 Inside, the Volvo V60 Sportswagon is comfortable, insulation is easily right up there with the best in this class, but the stiff suspension setup lets things down a little. On the motorway, however, it does settle down. The Polestar is expensive, but if ride quality is important to you it’s the one to go with. Tailor-made dampers come as standard, and most bumps and lumps are nicely smoothed out. 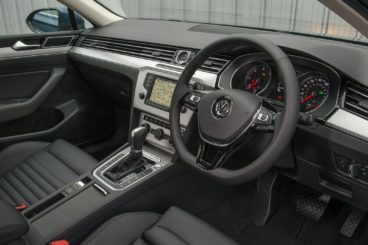 The dashboard is stylish, all models get a 7” screen as standard, while entry-level models also get cruise control, Bluetooth, a digital radio and sat-nav. Practicality is something Volvo used to do very well, but it’s a different story these days. The boot measures just 430-litres and the rear seats are cramped. Still, no boot lip and the sheer amount of space up front are pros. The new Mazda6 Tourer is another stylish Estate that’s great fun to drive. It also boasts an excellent selection of powerful engines that don’t cost an arm and a leg to run. 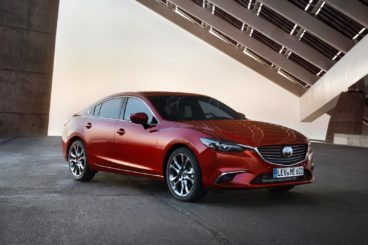 There is a certain sportiness to the way the Mazda looks and that creates the worry that its driving experience won’t be able to live up to expectations. Thankfully, that’s not the case here. The steering is positive, you can take corners with enthusiasm, and there is little body lean. Potholes are another story. Hit one and you’ll certainly know about it. In terms of its engines, the smooth, range-topping diesel engine is our top pick. It does 0-62 in just 8.0 seconds flat, makes overtaking a cinch and gets paired up with a compliant gearbox that encourages you to use all its power. The petrol engines will be less popular with buyers, but they’re still solid choices. A 2.0-litre engine is available with either 143 or 163bhp respectively, with the former completing the 0-62 dash in 9.6 seconds and the latter doing it in 9.1 seconds. That said, both engines make more noise than the diesels and feel slower than those numbers suggest. However, they’re fairly affordable to run, with the 143bhp variant returning 50.4mpg and the 163bp variant returning 47.9mpg at best. The diesel engines are cheaper still, with the entry-level 148bhp model returning 67.3mpg and our top pick, the 173bhp variant returning 61.4mpg. Inside, there is no doubting the quality of the Mazda6 Tourer’s design. Its dashboard is easy on the eye, looks sporty and gets lots of buttons behind the steering wheel. There are lashings of chrome here and there, the revised graphics on the infotainment screen bring the car into the modern era and insulation is better than last time. More sound-deadening materials and better door seals have helped to this end. However, there are one or two grievances. The quality of some of the plastics is questionable, while the infotainment screen does without Apple CarPlay. Still, the car is a triumph if practicality is your biggest concern. Headroom is excellent, three adults can sit comfortably in the rear, and the boot measures 506-litres. Fold the rear seats and you can extend that to 1,648-litres. The lack of a load lip is a bonus. Few mainstream family cars do upmarket better than the Passat. It might not have the badge appeal of a Mercedes, but this is as close as you’ll get to such a prestigious car for less money. It’s large, spacious, luxurious and relaxing. In short, the new Volkswagen Passat Saloon makes perfect sense.